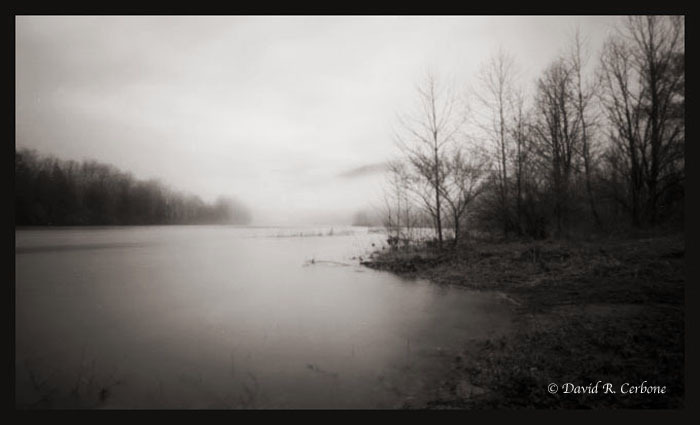 I first ran into David Cerbone and his work almost 8 years ago in the forums on f295 at a time when both of us were discovering the softly focused world of pinhole photography. Right from the start, there was a theme to his work. 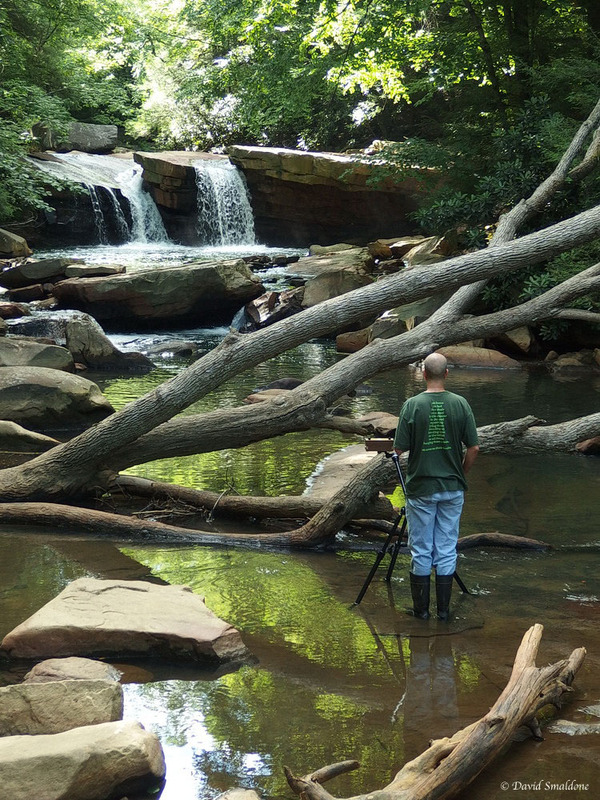 The guy was excellent at shooting these captivating scenes of rivers and gullies. In the years since, he’s stayed true to that vision while refining the technique. He’s a rarity these days, staying focused largely on one area: the Cheat River, tributary to the Monongahela River Basin. 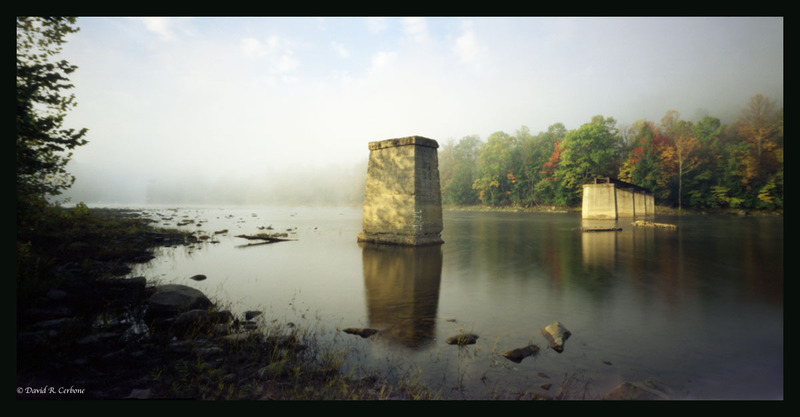 Years of focus, exploration, and constantly looking for new ways of seeing has yielded a well rounded body of work that puts the viewer into the thick of this West Virginia landscape. David has always been incredibly giving of his time in discussions in the past, and this interview is no exception. After the interview, be sure to have a gander at his Flickr photostream for more of his excellent work. First, tell us a little about yourself. What was your journey to photography? In real life, I am a professor of philosophy at West Virginia University. I have lived and worked in West Virginia for over fifteen years now (my first semester teaching at WVU was in the Fall semester of 1998). My main areas of interest in philosophy are oriented around the works of Martin Heidegger and Ludwig Wittgenstein, and more generally around the area known as phenomenology. I’ve written three books, the most recent a short introduction to existentialism, which is out this month. What had been a teenage passion was only rekindled after my wife and I moved to Albright, in Preston County, West Virginia. The camera came out of storage, initially out of duty (my wife wanted me to get a picture of her in a parade at the Buckwheat Festival), and then stayed out. I began exploring my still new surroundings in Albright and started developing a series of obsessions. For well over a year, I photographed a number of rusty nails that I found sticking out of old lumber, as well as the rust patterns on the corrugated metal roof of our barn. I also now had a little bit of money, unlike when I was a teenager, and so I could buy a lot of the gear I had dreamed about as a kid (and as the digital revolution picked up steam, the film gear I wanted just got cheaper). Having different kinds of equipment encouraged different ways of exploring. Sometimes, I think I love the cameras themselves nearly as much as I love the end result. While there is considerable merit in working expertly with a small array of equipment, in my own case, I find that using different cameras encourages me to think and see in new and different ways. The community at f295 was really welcoming and I think that helped in moving me more in the direction of pinhole photography. I also have been in photography for a very long time, but also with some years-long breaks interspersed. How do you think these breaks from photography have helped your vision? That’s a tough one to answer. I think there is a special kind of intensity that comes from a rekindled or rediscovered passion that is different from the excitement of doing something completely new. In the case of rediscovery, you’re tapping into something that has been lying dormant and there is both the feeling of its reawakening, along with the challenge to take it further. I guess the biggest difference for me is that I come at photography now as a grown-up. I am probably a bit more patient, a little more adept, and I am able more easily to follow through on ideas that I have. I also now have an incredibly rich environment to explore through photography. When I first started doing photography, we lived on Long Island and I had the shoreline of Long Island Sound to photograph (I still have a couple of pictures from that time up on my wall), but in between, I mostly lived in cities. I appreciate urban photography, but it is not something I have ever felt an urge to try doing myself. As of this writing, your Flickr Photostream has 854 photos and, while I’ve not done an official count, it seems that as much as 90% of the photos are of river valleys in your immediate area. Where is this place that you’ve studied so much? Pretty much all of the river-oriented photographs I’ve taken were made in the Cheat River watershed. Most are of the Cheat River itself, but I’ve taken a bunch along Muddy Creek, which runs into the Cheat down below my house. All of my regular go-to spots are in Preston County, West Virginia, between Albright and Rowlesburg. There are all kinds of creeks and “runs” where I live and I really need to get out and explore more. A friend of mine showed me a good spot by Deckers Creek, which runs between Preston County and Morgantown (which is in Monongalia County). I got some really nice pictures there, but I have not managed to get back. There’s an obvious love of the landscape here. Is this where you grew up? What is the connection you have to this area? I had never so much as set foot in West Virginia until I had a campus visit for my job at WVU. I grew up in southern California until I was 11 and then my family moved to Long Island, New York, to the small town of Port Jefferson. I went to college in New England and then graduate school in northern California, and prior to getting the job here, I was living in Chicago. So rural West Virginia was pretty far off my radar screen. Insofar as I thought about West Virginia at all, it was mostly via John Denver’s thoroughly inauthentic song (although that doesn’t stop it from being drunkenly sung in these parts). I think I knew there was coalmining and I probably had some familiarity with the usual Deliverance-type stereotypes. Even during my first year in West Virginia, when I lived in Morgantown, rural Preston County was something of a dark continent. I think I drove once through Kingwood (the county seat) in my first ten months living in the state. What changed things is that my soon-to-be-wife got a job at the hospital out here. She’s a midwife and needed to be close by for taking call (no one calls a philosophy professor in the middle of the night). So we looked for a house out here. The funny thing is that on her way to the job interview, she drove by what is now our house and saw that it had a “For Sale” sign. We never thought it would be in our price range, but real estate in rural West Virginia is nothing like California or New York. So we bought it. We got married on the front porch and all of our three children were born in our bedroom upstairs. We have now lived here for more than fifteen years and it is HOME in a big way. I say all this because my photography is in many ways an extension of this newfound sense of belonging. Many of my photographs are taken where the Cheat runs below our house. You can see the river from our house, especially when the leaves are down, and you can hear it when it’s running high. I walk my two dogs every morning down by the river and I can see the old railroad bridge through the trees, just slightly upriver from my daily walk. It is a place that I love and photographing what I see every day is one way of trying to express that love. If I pack up some cameras and spend a couple of hours early in the morning down by the river, I’ve already had a good day. If I get images worth printing or even just posting online, then I’ve won twice over. I don’t just stay within walking distance when I shoot, but even when I pack the car with gear, I’m rarely driving more than around ten minutes, so it’s still close to home. And since it’s still the Cheat River, it’s all connected anyway. You’ve photographed these valleys and hills in every season and condition. What’s been your favorite? That’s hard to say. Every time of year offers opportunities for good images. I love morning fog and Fall foliage. I’ve also had some success in the dead of winter, especially if we have had a nice snowfall. This past winter, though, it was brutally cold and mostly really drab, so I didn’t get out much. At the peak of summer, when it’s hot and hazy, I also tend to feel less inspired. The one exception is infrared photography, which cuts through the haze and really does wonders with all the greenery. If you don’t mind me saying so, you seem to be an “old soul” of photography. 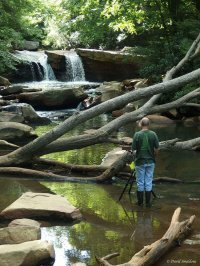 Years ago, photographers and other artists would spend a lifetime studying one subject or geographic area. It’s a tradition that sometimes feels lost in today’s era of gun-and-run digital photography. Is working this way something you’re compelled to do? An itch you absolutely must scratch? I’ve already talked about the love I feel for this place and that is one way in which I feel compelled to keep exploring my immediate environs. I also tend to work in photography via fixation. This can be in terms of a particular place, a particular subject matter, or a particular kind of image. There were those rusty nails I mentioned, but the old railroad bridge has been another one of these ongoing obsessions. Sometimes I will stumble upon something and then I will be occupied for weeks, months, or even years exploring whatever that is in different ways. For example, for a long time when I would go upriver to a stretch of the Cheat known as the Narrows, I was mainly interested in scenic shots that took in wide expanses of the river. But one time, for some reason or other, I tried some shots of just a couple of rocks where water was being forced through. I really liked what I got and so now I will spend as much time looking at a two or three foot stretch of the river as I will the whole scene. In general, I really like the way these familiar spots continue to offer new opportunities for making good photographs. There’s a lot of repetition to my work habits. Many rocks along the riverbed feel like old friends, since I end up setting my tripod at just that spot over and over again, even when I think I’m out for something different. I will move about, looking out at the scene before me, and just be drawn again to the very same place and then I’ll think, “Oh yeah, there’s that slightly rectangular rock,” or “Here’s that one that’s just a little flatter than the others around it.” But even when I set up in the same place, something different always results. Every semester in my introductory philosophy class, I teach Heraclitus, one of the central figures in the pre-Socratic era of Western philosophy. Heraclitus is most famous for the fragment declaring that one cannot step twice into the same river. When I teach this fragment, I always explain it by describing my daily walks by the Cheat. In some sense, it is the same river, day after day, year in, year out, but in a different sense, photography proves Heraclitus right: one can never get the same photograph again, no matter how precisely one tries to recreate the conditions under which the first was taken. From frame to frame, from roll to roll, from day to day, something changes: the level of the river, the contours of the banks, the number of stones visible, the angle of the light, the movement of the water, the state of the surrounding foliage, even the color of the water itself. One can return to the same place over and over again, but it will never look the same, never offer the same look, and in that sense, it will never be the same either. Photography, which is usually understood as the ultimate attempt to capture and preserve a moment, to freeze and so keep it forever, also shows to us this transience. Since ƒ/D is focused on the art of pinhole photography, I’d be remiss if I didn’t ask: why is pinhole photography such a predominant medium for your work? Does it give you something other mediums lack? I kind of stumbled onto pinhole to start. I was flipping through a B&H Photo catalog a number of years back (when they still used to send out catalogs) and noticed the line of Santa Barbara 4×5 pinhole cameras they carry. They looked sort of cool, and so I started poking around online to learn more about them. I noticed that I liked a lot of the images people were making with pinhole cameras. I also discovered that you could use these cameras with Polaroid film, which made them seem even more intriguing. So I got one (or maybe a couple). At first, I was kind of excited just to get an image. There’s something about pinhole photography that invites both skepticism and wonder: you look at the camera and it’s just a box with a tiny hole. No shutter, no optics, definitely no LCD screen. I found it hard to believe at first that anything could come of exposing film in something like that. But sure enough, it works. The images are not sharp like with cameras using optics, but they have their own charms. I found that I didn’t mind the lack of sharpness compared to photographs made with optics. 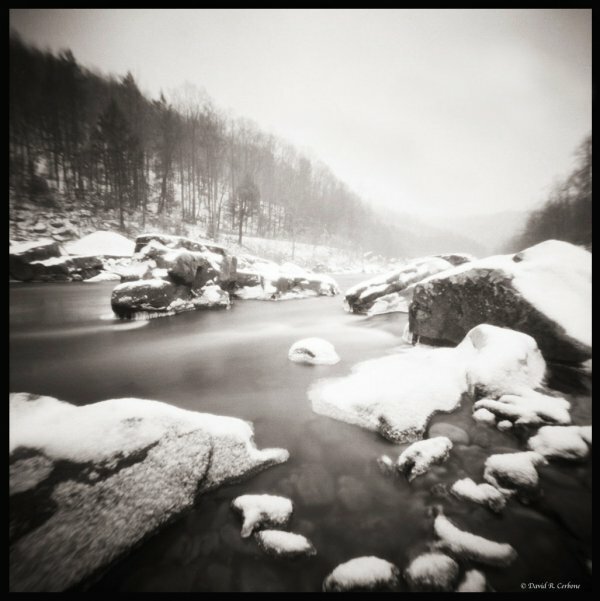 Indeed, the slight softness of pinhole images gives them something of a painterly look, which I really like. I also liked having so much less to worry over: what lens to use, what f-stop and shutter speed, and so on. Pinhole photography is very liberating in that way. Framing a pinhole photo is always a tentative, approximate affair, and the unlimited depth of field afforded by the pinhole frees me of worries about depth of focus while offering new ways of exploring near-far relations (I couldn’t have come close to the images I’ve made of rocks in the river, for example, using a standard camera with a lens). The exposures are generally very long, and a bit of movement, the flow of water, a shifting cloud, even a gentle breeze can alter the image considerably. A good pinhole photograph is always something of pleasant surprise, something I cannot take full credit for, as my control over the outcome is far more limited than with a standard camera: the feeling I get in viewing a pinhole photograph I’m happy with is more one of good fortune bestowed than pride or accomplishment (perhaps this is why pinhole photographers are so low-ego, and generally so sharing with their tricks and techniques). Though all of photography retains for me an element of magic (first felt when seeing an image emerge on what had been blank piece of paper), pinhole photography strikes me as especially magical, especially incredible: it continually astonishes me that an image – a detailed rendering of a scene – can be achieved with little more than a tiny hole poked in a thin strip of metal. I’ve backpacked a number of times in the hills of West Virginia, but never exactly in your area yet, when I first saw your photos, I knew exactly where they were. The land and rivers of WV permeates everything it touches, including the people and the things those people build and do. It’s one of the few areas that come to mind where taking photos of the landscape seems synonymous with taking photos of the people. Do you feel that your methodic exploration of the Cheat and its valley have brought you closer to the people you now live around? Living in rural West Virginia, I will always be something of an outsider. Many, if not most, of the people who live here have done so for generations upon generations and so they have a sense of place that I cannot begin to approach. But I think getting out and exploring the area, creating images in response to what I see, has at least helped me appreciate that deep sense of place and maybe tap into it a little bit. Making photographs of the Cheat River is my way of trying to express my admittedly newer-found attachment to where we live. I have over the past several years started showing my work occasionally at a few galleries in Preston, Monongalia, and Tucker Counties. I also peddle my photographs at some of the local festivals, most regularly at the annual Cheat River Festival here in Albright. Doing these sorts of things has put me out there with my work among people. I am not always comfortable doing this: I don’t have the “gift of gab,” I’m not a natural salesman, and I often feel very self-conscious about my work. I also don’t like the way appreciating and purchasing often get run together. But on the whole, I think it has been good for me to display my work and talk about it with whomever happens to walk by and take an interest. Once a young woman made a point of telling me that one of my photographs was hanging in her living room and it made her happy to see it there every day. But I also just like getting a positive response from people, even if they do not buy anything. The nicest thing ever told to me came from a very local guy, maybe around my age. He didn’t buy any of my photos but he spent a long time looking at them. Before he left he said something like, “You know, you’ve really captured the beauty of this place with these photographs. Whenever I’m driving here (Route 72, which runs along the Narrows), I always tell my kids to look out their windows and see how beautiful it is where they live. These photos really show that.” The locals at these events nearly always recognize the sites where my pictures were taken, but they are sometimes surprised at how these familiar places look (this is especially the case with the bridge here in Albright). On these occasions, I like to think of my photographs as like that dad with his kids, pointing out to them, and so reminding them of, the beauty of this place.